An anti-Fisk poster hung by activists in a Pilsen Thrift store. 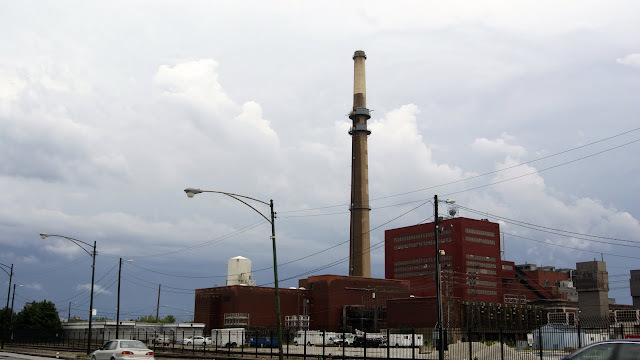 NOTE: The following is the last in a series of four stories about the environmental and health impact of coal fired power plants on densely-populated, low income Chicago communities. 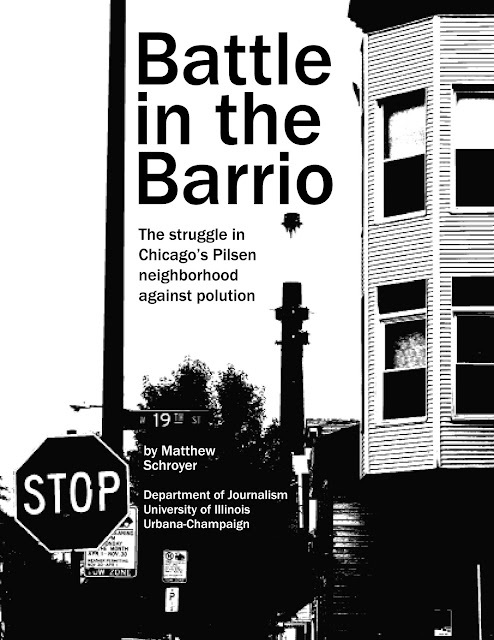 It's called "Battle in the Barrio: the Struggle in Chicago's Pilsen Neighborhood Against Pollution." The series is a journalistic project that culminated in a master's thesis for the University of Illinois at Urbana-Champaign. 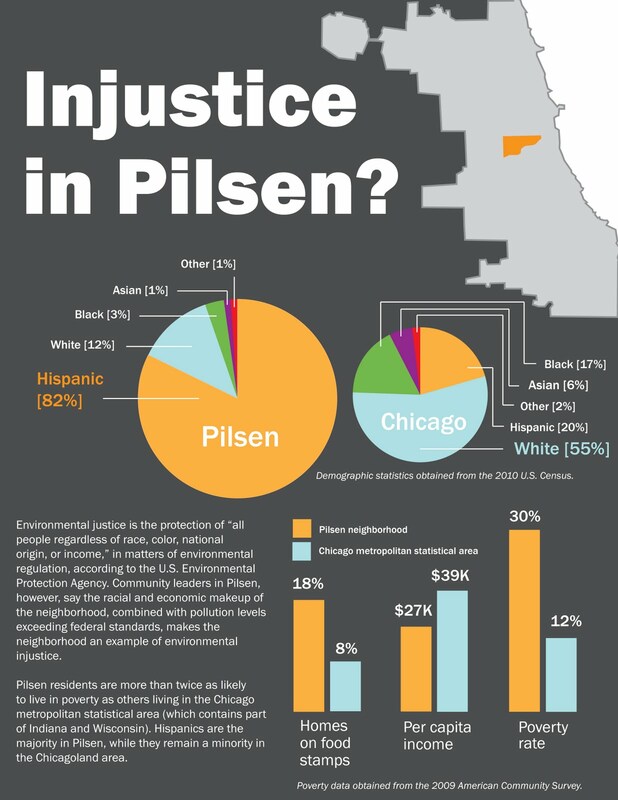 Visualization - Is there injustice in Pilsen? If you have the time, Maria Torres has stories. Since she became a community organizer a decade ago, helping gather signatures for petitions and lately rallying support for the Clean Power Ordinance, she’s collected quite a few. Mostly, they involve people who’ve suddenly come down with asthma, respiratory illnesses, rare forms of cancer, lupus and other medical abnormalities. In addition to the verb “scares,” as in, “it scares me,” and “freaks,” as in “it freaks me out,” she frequently uses the adjectives “spooky” and “weird” to describe the magnitude of health problems she’s heard of while knocking on doors as a community organizer in Pilsen. There’s the story she heard about an 80-year old woman, who lives on Morgan between 18th and 19th streets, not far from the Fisk plant, and got a routine X-ray for breathing problems. The doctors asked the woman’s daughter, who took her mother in to be examined, if the mother was a regular smoker. This visualization was produced as part of a series about Pilsen, a Chicago neighborhood, and its struggle against pollution. Parts one, two and three of that series have been published on MentalMunition.com. - Excerpt from page 92 of Midwest Generation’s 2010 report to the Securities and Exchange Commission, form 10K. NOTE: The following is the third installment in a series of four stories about the environmental and health impact of coal-fired power plants on densely-populated, low income Chicago communities. It's called "Battle in the Barrio: the Struggle in Chicago's Pilsen Neighborhood Against Pollution." Part one, "Four Sisters, One Rare Disorder," is available here. Part two, "Old Problems, New Attention" is available here. A visualization describing Pilsen's struggle with pollution is here. In a dimly-lit space in the back of a Pilsen café known for its fruit smoothies, a dozen Pilsen Environmental Rights and Reform Organization (PERRO) activists and organizers huddled over coffees and discussed upcoming plans for an annual community festival, Fiesta del Sol. A Pilsen tradition for the last 39 years, Fiesta del Sol is an event featuring local art vendors, Mexican food, carnival rides, soccer games, and a chance for local organizations to boost donations and deliver information to the public. 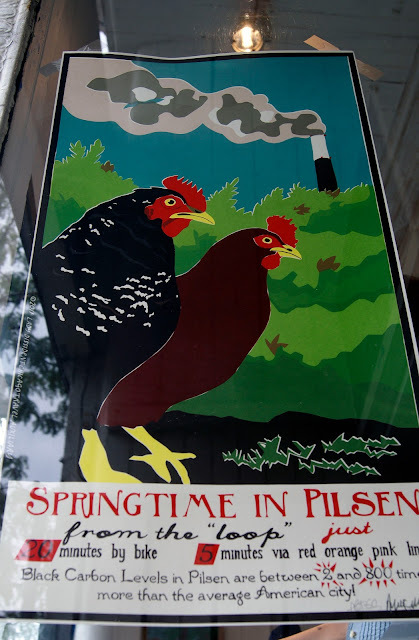 The Pilsen neighborhood in Chicago faces unique challenges in terms of environment and health. It retains some of its manufacturing base from when it was an industrial center for Chicago, yet it is primarily residential and now houses a large Latino population. The combination of a dense population and high emissions mean that pollution for the neighborhood is a major concern, as the above visualization demonstrates. This visualization is part of the series "The Battle in the Barrio: The Struggle in Chicago's Pilsen Neighborhood Against Pollution." Part one, "Four sisters, one rare disorder," is here. And part two, "Old problems, new attention," is here. The Fisk Generating Station, Pilsen, Chicago. - Rev. Patrick Daymond, Sixth Grace Presbyterian Church, in testimony before the Chicago City Council, during hearings on the Clean Power Ordinance. 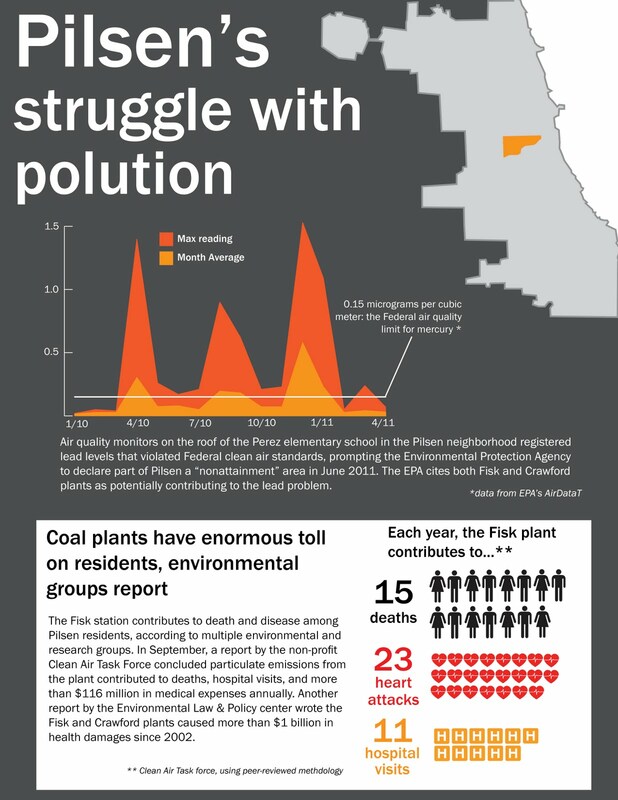 NOTE: The following is the second of a series of four stories about the environmental and health impact of coal fired power plants on densely-populated, low income Chicago communities. You can read part one, "Four Sisters, One Rare Disorder," here. More parts of this series, along with visualizations and some interactive elements, will be posted in the coming weeks. They come in at the same time every day. The lumbering train pulls more than 100 of them, each full with black coal rocks, up to the Will County Generation Station, where the contents are unloaded, mixed, and put on several barges and sent up river. The barges meander up the Chicago Sanitary and Ship canal, where they dock alongside the Crawford and Fisk coal-fired power plants. The plants are owned by Midwest Generation, a Delaware limited liability company, solely owned by Edison Mission Midwest Holdings. In turn, Edison Mission Midwest Holdings is a wholly-owned subsidiary of Midwest Generation, EME, LLC. That limited liability company, in turn, is a wholly owned subsidiary of Edison International. At the plants, the barges are relieved of their burden and go back down the canal as empty shells. But the coal – that gets turned into electricity. The Fisk and Crawford plants, located in the Pilsen and Little Village neighborhoods on the lower west side of Chicago, respectively, together generate about 858 megawatts of power. It’s also turned into pollution. The plants released 3,372 tons of nitrogen oxides, 1,583 tons of soot, and 5 million tons of carbon dioxide in 2008, by the EPA’s count. On May 24, things did not go as planned at the Crawford and Fisk plants. 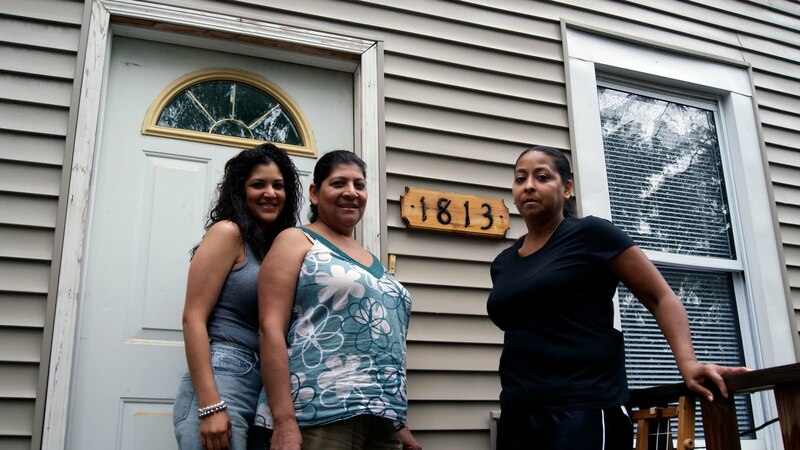 From left: Lizette, Martha and Gloria Herrera, outside their family home in the Pilsen neighborhood of Chicago. After a lifetime of living near the Fisk coal-powered plant, Martha and Gloria have developed lupus. Martha’s daughter, Lizette, also is showing early signs of the disease. NOTE: The following is the first of a series of four stories about the environmental and health impact of coal fired power plants on densely-populated, low income Chicago communities. It's called "Battle in the Barrio: the Struggle in Chicago's Pilsen Neighborhood Against Pollution." More parts of this series, along with visualizations and some interactive elements, will be posted in the coming weeks. The series is part of a journalistic research project that culminated in a master's project for the University of Illinois at Urbana-Champaign. For most of their lives, two of the four Herrera sisters -- Gloria and Martha -- thought that the hardest part of living in the Pilsen neighborhood of Chicago was staying safe from crime. On a mid-July morning, as a fast-moving thunderstorm poured cool rain over the neighborhood and provided relief from the most oppressive heat wave in years, the two sisters reflected on some close calls. “We were never allowed to hang out on the sidewalk,” Gloria, who is now 43, remembered of her childhood in Pilsen. Outside, thunderclaps ricocheted off of the old brick houses, off the pastel-painted facade of restaurants with names like Nuevo Leon, La Casa Del Pueblo and La Cebollita, off murals of Che Guevara, Jesus and Mexican cowboys. The day before, the National Weather Service measured a high temperature of 99 degrees from the Chicago O’Hare International Airport, with 78 percent humidity. The temperature, measured by the television station the sisters had muted while they talked, fell to 71 degrees. The raindrops splashed on the porch they had spent their summers on as children. “We had, like, four different gangs all around us,” said Martha, 54. The streets belonged to the gangs. There was, however, something that belonged only to the children in the neighborhood. The nearby playground of Benito Juarez High School provided a level of safety from the industrial streets of Pilsen, and a place where children could be themselves. Gloria and Martha still had to keep on their toes on the nine-block journey between their home on Carpenter Street and the high school. “We would be coming back from soccer practice at five in the afternoon, or seven in the evening, and the gangs would be shooting at each other, and we had to crouch down and run home for two blocks. We would be hiding between cars just to get home safely,” Gloria said. And even at home, the threat sometimes lingered. Gang violence is an ever-present part of life in Pilsen, a sooty, post-industrial barrio on Chicago’s lower west side. But just in the last several years, a very real threat has trumped the Herrera’s safety concerns about gang violence. Unlike a stray bullet from a gang-banger’s gun, it could not be dodged by hiding behind cars. Gloria remembered the exact day it started: Feb. 7, 2001. “I remember, because it was very traumatic for me,” Gloria said. Gloria was diagnosed and treated for pneumonia and sent home. On July 7, she suffered a heart attack at work. A co-worker took her to the University of Illinois Medical Center, where hospital staff administered a battery of tests and determined that Gloria’s liver and kidneys were shutting down. Doctors gave her three days to live. “It was our 9/11,” Martha said.